I went into a small Asian grocery store simply to see what they had as I have never been to that particular one before. It was distinctively Vietnamese as I could tell by the owners. While in line waiting to pay for the baby bok choy and Chinese broccoli (gai lan), my usual vegetables of choice, I saw these gorgeous pieces of fruit piled up everywhere. 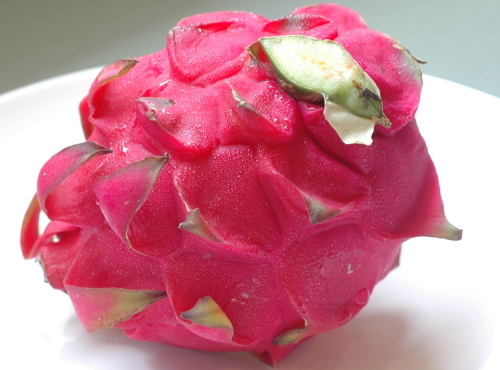 I had only seen them in movies, and there they were beckoning me with their bright pinkish red skin looking almost like artichokes. Not having eaten one before, I wondered if they needed to be steamed like artichokes and eaten the same way. I never thought about what may be inside such beautiful structures. Apparently you peel from the center out, and what you get is freckled meat inside. 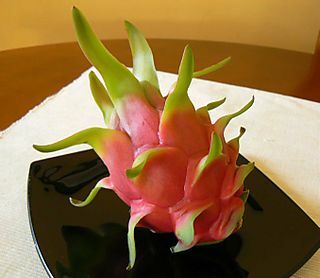 I have yet to taste it as I didn’t buy one at the time, thinking it may not be an ideal situation to try out new fruit unless you are with company, especially if you are prone to allergic reactions. This looks really exciting, though, and it has infinite possibilities in use – I’ll have to look up recipes. Not only is it beautiful, its name is absolutely worthy of my obsession. 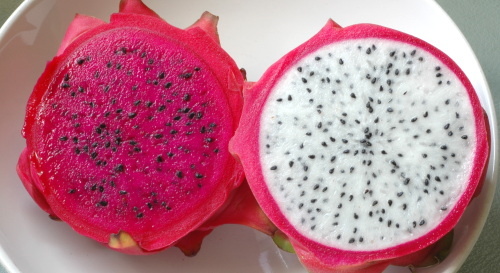 Oh, dragon fruit, welcome to my world.